iMA is a universal language that is helping people in 40 different countries communicate more effectively with one another. the other person finds it easiest to listen to. 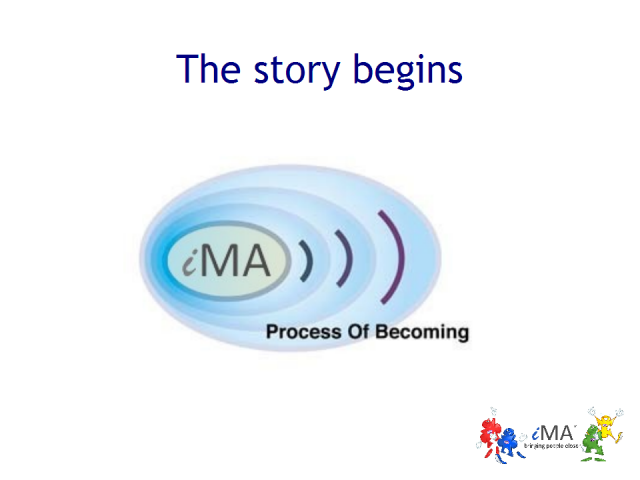 I am iMAs creator and am delighted to share information on how iMA started,where it is now ,and where it is going. Executive leaders that are willing to take risks and stay on the cutting edge of marketing trends often position themselves to capture lots of new business, talent and market share. The most successful leaders, however, know how to build a strategic foundation that is strong enough to support innovative trends while providing a tried-and-true baseline that keeps things grounded as the marketing landscape continues to evolve. Join Launch Marketing’s Founder and CEO Christa Tuttle as she illustrates how webinar attendees can create best practices that can evolve into “next” practices, moving the needle on both innovative and stable success. This presentation will cover several cornerstones of B2B marketing, including messaging and positioning, integrated marketing plans, marketing automation and more. B2B organizations that thrive and grow do so with a reliable, well-oiled lead and demand generation engine in place. Creating a current that keeps prospects engaged throughout the sales funnel requires a balanced mix of automation, thought leadership, well-planned campaign structures and more. Join Launch Marketing Founder and CEO Christa Tuttle as she leads webinar attendees through three T’s: "Technology, Trust and Timeliness" that will guide B2B marketers who wish to not only fill their funnel, but also create a revenue-generating wave that keeps prospects flowing towards customer status. People unsubscribe from email lists all the time. That’s not necessarily a bad thing since it helps in keeping your database clean and up to date. Plus, in this way, your email marketing reaches the best audience. Focusing on engaging subscribers is must. In this webinar we will share some awesome tactics that may turn their decision around. According to Frost & Sullivan, about 98% of companies are either developing a digital transformation strategy, or are in the process of implementing one. But what does that really mean? For marketers, Digital Transformation can represent everything from an omnichannel strategy to deploying bots and AI tools to perfect the customer interaction. This session will show you how to start your digital journey today by tapping into the latest marketing technology (“MarTech”), while laying the groundwork for truly transformational change in the months and years to come. What really matters to your brand? Chances are it's not the number of clicks on your advertising campaign. LoopMe's Global Marketing & Communications Director explains how AI can make the most of your data and deliver results against what really matters for your brand - sales, store visits and brand sentiment. We are thrilled to introduce the second-annual BrightTALK Awards honoring top content creators on BrightTALK. With 8M total active users on BrightTALK and thousands of talks taking place each year, BrightTALK has first-hand access to a vast pool of engagement data. We analyzed all of the content shared on our platform in 2018 across thousands of data points to determine which clients and partners are truly exceptional. Join BrightTALK's VP of Product Marketing Val-Pierre Genton as he sits down with Jessica Carter, Sr. Director, North American Marketing at AccessData, to learn about her team's success. You'll walk away with insights into AccessData's webinar and video program and tips and tricks that you can incorporate into your own marketing strategy. Join BrightTALK's Natalie Cerri as she sits down with Gael Schmid, Digital Marketing Manager EMEA at Commvault, and Elizabeth Fernandez Cuervo, Senior Marketing Manager at The International Association of Women, to learn about their success. You'll walk away with insights into their webinar and video programs and tips and tricks that you can incorporate into your own marketing strategy. Join BrightTALK's CMO David Pitta as he sits down with Stephanie Kubina, Webinar Program Manager at Symantec, Deb Calvert, Founder of The Sales Experts Channel, and Hillary Baron, Program Manager at Cloud Security Alliance, to learn about their success. You'll walk away with insights into their webinar and video programs and tips and tricks that you can incorporate into your own marketing strategy. Join BrightTALK's Anthony Heaton as he sits down with Thibaut Rouffineau, VP of Marketing at Canonical, and Chris Geisert, CMO at Lockpath, to learn about their success. You'll walk away with insights into their webinar and video programs and tips and tricks that you can incorporate into your own marketing strategy. Join BrightTALK's CMO David Pitta as he sits down with Martin Horlington, Head of Sales & Marketing, HRreview & Symposium Events, to learn about his team's success. You'll walk away with insights into HReview & Symposium Events' webinar and video program and tips and tricks that you can incorporate into your own marketing strategy. Customers no longer want to be sold to. They want sellers that help them to make an informed decision. But how do business leaders go about moving their business and their people into this new era? This webinar by internationally acclaimed SMarketing Expert Peter Strohkorb will give you 10 Action Points that you can implement in your business immediately. Have you ever presented a killer campaign only to have management reject it because they didn’t like it? Or worse, did you get pressured to move forward with creative elements you knew wouldn’t resonate with your buyer? Or maybe what you’re getting back from design is not hitting the mark and you can’t figure out why? The disconnect between our buyers and those who approve campaigns is often large and painful to cross. Yet bridging the gap between the art and science of marketing is a job we can’t afford not to optimize. In this session, we’ll explore proven methods for using buyer insights to not only enable creative processes to thrive but to appeal to the measurement obsessed approvers at the company. Like all living, breathing things, a successful marketing program needs the right backbone to keep everything functioning and running smoothly. In the case of a marketing team, this means they need the right technologies, processes and data inputs in place and running together to ensure programs are driving impact in the right places with the right people. Learn how best of the best, like Box, Commvault and Hitachi, have set up their tech stacks for success. The marketing plan is obsolete. A nimble marketing strategy and a team with the ability to manage changing priorities and better collaborate - with project visibility across the entire department - is the holy grail for marketing leaders. But the million dollar question is, what’s the best way to implement an agile marketing process and what tools do you need to make it all work? In this session, learn how to identify roadblocks, accelerate delivery of campaigns, and focus on 10x projects -- not the 10% ones. - Modern B2B content marketing and what it really means for earned, owned and shared media. - How democratized content co-creation enables quality content at scale. - Redefining what influence is and what working with B2B influencers means for content marketing. - Key opportunities to integrate UGC, employee advocacy and influencer marketing for meaningful content that delivers impact. Content marketers have made great strides in recent years, but connecting effectively with senior executives remains one of the toughest challenges. C-suite and other top executives at our customers and prospects are absolutely interested in new ideas, new ways of doing business, and innovative solutions… so long as they are truly relevant, credible, and timely. Executive standards are really high and breaking through the competitive noise is no simple task. Join ITSMA’s Rob Leavitt and Julie Schwartz to review new research on executive preferences for content and engagement, and five guidelines to orient content marketing to what really works to connect with the executives that matter most. Marketing today plays a central role in driving growth as businesses look to win the most important real estate in the world – a piece of your heart and mind. As our world rapidly evolves with the physical and virtual blending, consumers are increasingly engaged in digital self-nurture, complemented by analog immersive experiences that strengthen our bonds. CMOs are expected to be business leaders and change agents with “THINK BIG” strategies. We are expected to define brand purpose – have the vision and “why narrative” and to keep the company aligned to its NorthStar. We are expected to tackle big market trends with the magic of storytelling that’s supported by data, analytics, and digital platforms – combined with human-centric understanding – to drive revenue and deliver exceptional customer experiences. The CMO’s role has never been more exciting or more relevant, and in this talk we will explore what 2019 holds for us and what trends, disruptions and priorities we need to flawlessly address in order to win hearts, minds and $. Join this webcam panel and hear the latest insights from our panel of experts. Now more than ever, companies need to invest time, money & resources into building their thought leadership. In this webinar, we will discuss how executive bylines (op-eds / opinion pieces), industry conferences & webinars can help companies establish credibility and influence in their markets. - Present a problem and solution instead of promoting your specific product or service. After several decades as a serial entrepreneur (raising more than $100 million in venture funding), David founded Rosebud Communications, a strategic PR firm that works with high-growth technology companies across a variety of B2B verticals. He & his work have been featured in The New York Times, The Economist, WSJ, Fortune, Forbes, & The Washington Post. Denise works with executives to accelerate their journeys from leader to thought leader. She is a lecturer on thought leadership at Stanford Business School & a guest author for Salesforce.com, Inc.com, Fast Company, Entrepreneur & Forbes. Denise graduated with a Stanford MBA, and has spoken at major tech companies including Roche, Microsoft & Google. Geoffrey is a compelling voice at the intersection of marketing, tech, media & popular culture. He is Head of Brand Studio at Microsoft Advertising, where he develops innovative concepts as a form of business development & collaboration with partners. Prior to joining Microsoft in 2013, Geoffrey was vice president of digital strategy at Ogilvy & Mather in New York City. Colon has done work with several influential brands including Spotify, Netflix, American Express, Coca-Cola, IBM, The Economist, USA Network, WWE, History & Red Bull. Marketing experts share tips and best practices for achieving success with email, social media, demand generation, mobile marketing and other trending topics.